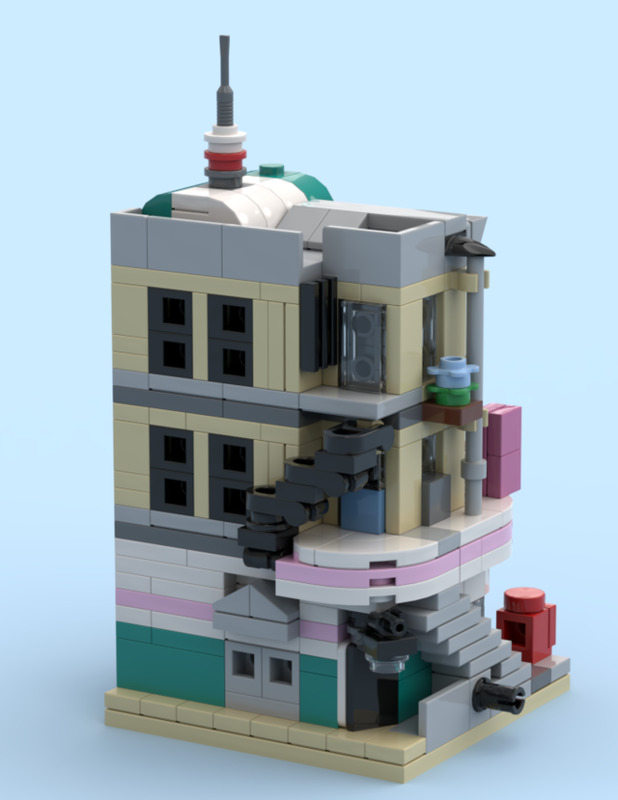 As I don't have enough space to display all the normal modular buildings, I was happy to get the mini modular version (10230). Unfortunatelly 10230 never was continued... So I've build the mini modular versions published by Oscar (o0ger) the last years. 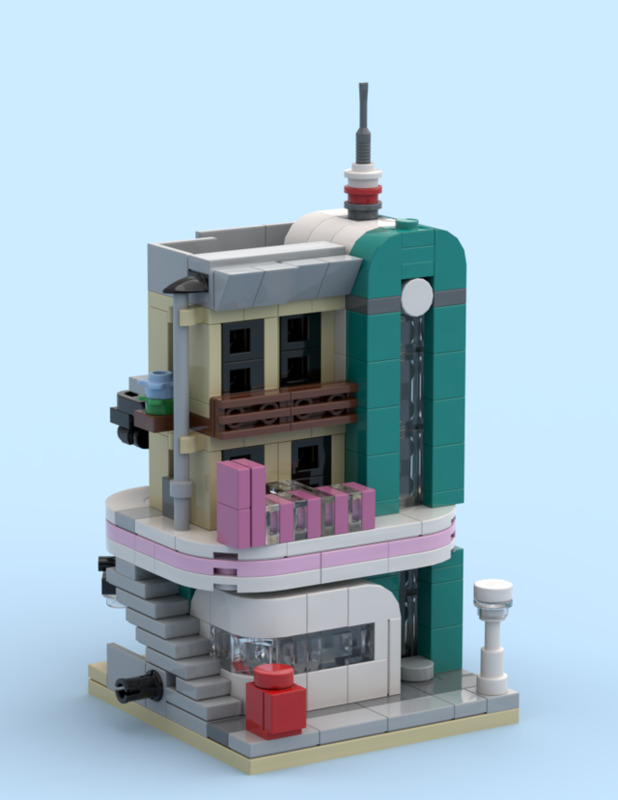 So I learned a lot of SNOT techniques at Oscars MOCs and build my own mini modular DD. 8x8 base plate. Fully buildable with 395 parts. No illegal connections. Many many SNOT and offset techniques. Use of regular available parts. No rare, high priced pieces. Lego PAB is approx. 35-40€. Stability of all parts was checked positive. Height fits the Lego mini modulars. I've tried to contain as much details and proportions as possible into the mini version. # At the backside there is an offset of 1/2 stud at the first floor relating to the base plate dimension. # The friction pins are cut in half and the right side friction pin area has some gaps because of the ground floor offset. With removing the technic bricks and pin you can completely close these gaps using a 1x3 teal brick and jumper plate. And I had to use a single colour option at the outer side of the roof. 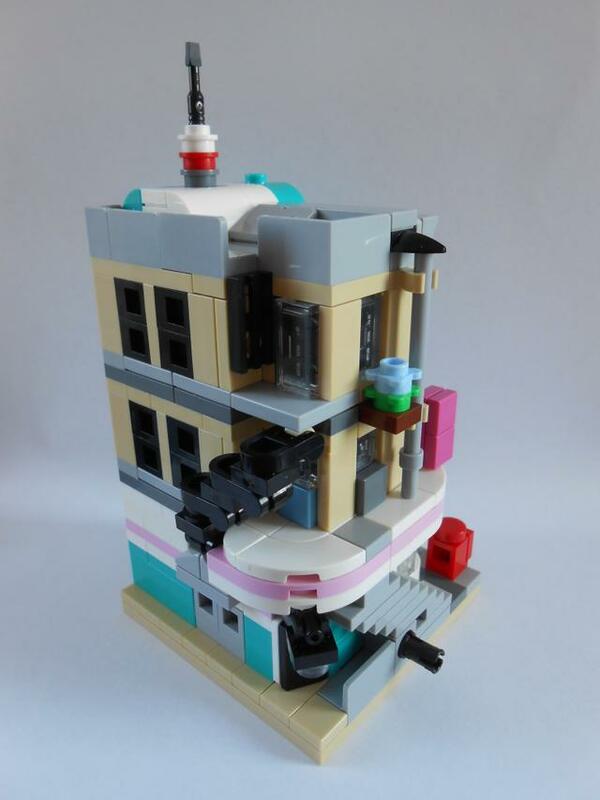 There is a 1x4x1 1/3 teal brick as Lego doesn't offer any suitable 1x1 rounded part to build a white/teal edge as on the inside roof. In favor of the front view I decided using these option. Maybe there might be a better solution with new parts in the future. Attention: LDD file is missing one 36840 piece, as it's not available in LDD. So this one is not included in the BOM! Also LDD still uses old element/design ID numbers such like the 1x1x2/3 roof tiles or trans clear parts. Newer parts are available and much more cost-effective. 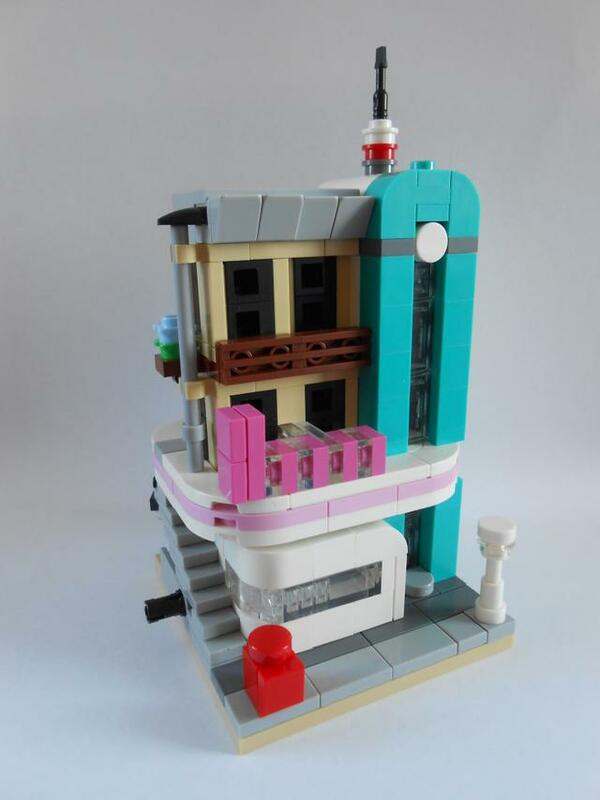 Please check brickset parts database. Wow! That's absolutely amazing. The amount of details you were able to cram into such a small space is simply astonishing! And as far I can see Lego hasn't used the white color of this item in any set. How did you get these white color if I may ask you? This is awesome! I think I like this version better then the full size one. This part in white is in the new Betrayal at Cloud City - 75222. 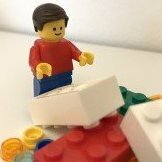 Parts list is not on Bricklink yet but it is on Rebrickable. You can buy the part on BL. yes, the 2x2 white tile bow is very new. 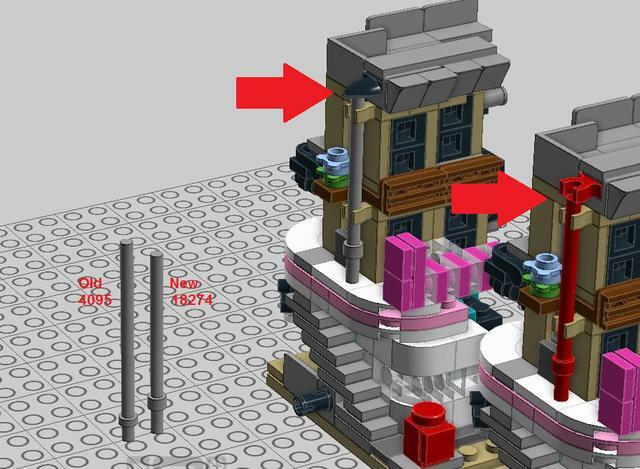 Please try the Lego shop replacement parts option to get these pieces. Use of regular available parts as much as possible without any disadvantages in the design. No rare, high priced pieces. Lego PAB is approx. 35-40€. Thanks for giving me the correct link to buy these white macaroni tiles. I have order them directly, so soon I can start building these great mini modular you. This is really cool, I never understood why Lego did not continue those mini sets officially. I guess the first lot of 5 never sold very well. I also don't really understand this Lego politics. This would be useful for people like me, which own the modular building line up but don't have the space to present all of them. While building the modular with real pieces I noticed that the rain gutter downspout I used in LDD is an old part. Last used in millenium falcon 10179 in 2007... Lego PAB & BAP doesn't offer this piece any more. I already updated the rendered pictures and LXF file in the first post. Pictures of the final DD mini modular. Especially teal and purple are slightly dull at rendered images. This is very lovely! really good parts usage. First off, your MOC is outstanding!! I love the amount of detail you were able to fit in it. I made my own version of the Downtown Diner a while back so I couldn't help but start comparing the two. Here's mine! I really like mine but I have to say that your model is far superior. Mine is just a digital creation while your's can be built out of real bricks. That being said, I was able to use parts that don't even exist. Hope you like it!